When we left Zagreb to head out to the coast of Croatia, we opted to stay in the charming little town of Trogir. We had taken the last flight out of Zagreb earlier that evening so we arrived into the Split airport around 11pm. It was just a 15-minute drive from the airport to Trogir and by the time we got there and checked in to our hotel, it was nearly midnight. We took a quick walk around the quiet streets surrounding our hotel, excited to have arrived, but didn’t really get a good glimpse of the town until the next day! Before I even talk about rest of the town of Trogir, first I have to mention how much we loved our hotel, Hotel Pasike! It was absolutely charming, located on the old town island of Trogir, and all of the employees were so welcoming and went out of their way to accommodate us. The next morning we got up excited for the day, beginning with the delicious complementary breakfast – it was quite a spread: breads and jams and cheeses, omelets and eggs to order, and of course, some of the famous Croatian coffee! After breakfast we set out to explore the little island. While the inner part of the island is a maze of narrow cobblestone walkways, the island is so small that you really can’t get lost. We easily found the main square, which is lined by the town hall, duke’s palace and cathedral. After wandering through the inner part of the town, we came out at the other end of the island by the Kamerlengo Fortress, built in the 15th century by the Venetians when they had control of the island. Then we walked back to the other end of the island along the water’s edge that was lined with yachts and a view of the mainland and another island just across the water. The entire walk didn’t take us longer than an hour or so – I wasn’t kidding when I said it’s a tiny island! So having seen most of the island, we then headed to the bus station, just over a bridge to the mainland to take a bus into Split for the day. Read about our time in Split here! 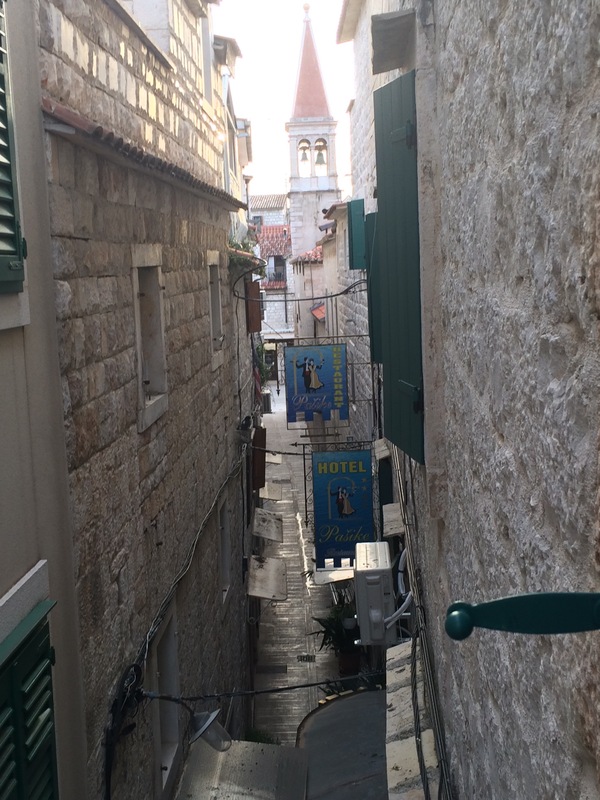 When we got back from Split in the evening, it was already dusk and the town was quieting down for the night. We had bought some snacks and a couple bottles of wine before leaving Split, so we spent a relaxing evening just catching up on the rooftop terrace of our hotel. You can add the view from the rooftop to the list of reasons we loved our hotel! Our time on the coast was so short that we realized that had we stayed in Split we probably never would have made it over to this picturesque town. Though we had read about day trips from Split, with only one day we wouldn’t have had time so we were so happy that we had chosen to stay in Trogir! 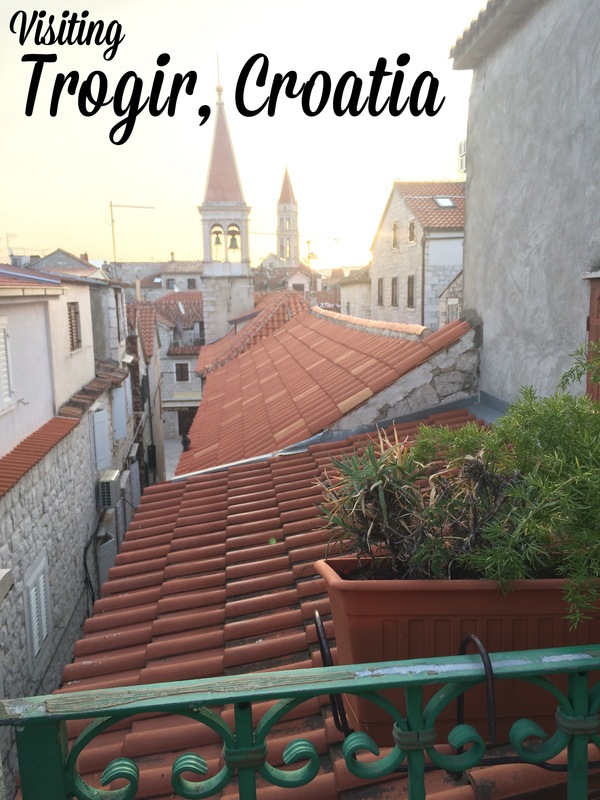 What really made our experience was the people that we met, between the employees at our hotel and the friendly locals we met on the street – that, along with the beauty of the town itself, is what really gives Trogir its charm! This entry was posted in Croatia, Europe, Eurotrip 2016-Croatia, Vienna, Budapest and Venice, Trogir, Croatia and tagged Croatia, Europe, Schmahl World, travel, travel tips, Trogir. Bookmark the permalink. I recognize some of these places from my trip last month. Trogir is such a pretty town!